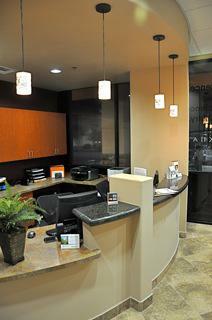 For 30 years, Beckham Dental has been dedicated to helping the Cave Creek, AZ community have healthy, beautiful teeth. We offer general dentistry services to help you keep a healthy smile, dry mouth treatment to combat tooth decay, solutions to help you freshen your breath, and even gum disease treatment to eradicate the infection. The key to this process is the amazing strength yet incredibly small size of these MDI's (about the size of a toothpick). Patients can literally eat a meal with their securely fixed dentures the same day the MDI's are placed. Implant dentistry is the most advanced therapy available to treat missing teeth for numerous reasons. Three important benefits of implant treatment are described below. 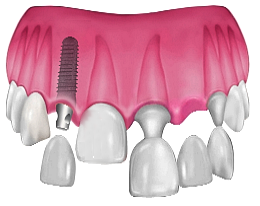 Implants can be placed in areas of the jaw where no teeth are present, or can be immediately placed into a tooth socket after the tooth has been removed. Tooth-colored fillings have always presented a more aesthetically pleasing alternative to traditional silver and amalgam fillings. However, due to evolving technology, they are now also stronger and more durable than their metallic counterparts. Indeed, a small filling may last a lifetime without ever requiring repair, while larger fillings should last for many years with appropriate care. Plus, tooth-colored fillings feel and function more like your natural teeth, allowing you to eat, speak, and smile with increased confidence and comfort. The bridge consists of an artificial tooth and two porcelain crowns, one for each natural tooth on either side of the gap. Dr. Beckham customizes the bridge to fit snugly and comfortably in your mouth, fixing it into place so that it cannot fall out or be removed by hand. The results are remarkably natural looking and extremely strong, allowing you to eat, speak, and smile with full confidence. Crowns, like veneers, dramatically improve the appearance of your teeth; however, unlike veneers, they cover the entire surface area of the tooth, helping to prevent weaker teeth from cracking or breaking. By strengthening these weaker teeth, they effectively reduce or eliminate pain, sensitivity, and difficulty with chewing and speaking. They are also commonly used to keep errant fillings in place. Whatever else their function, they will mask imperfections in the teeth, giving you a more pleasing, attractive smile. Teeth that fit, stay put and look great! There are an estimated 28 million edentulous (without teeth) Americans and that number is growing every day. Most of you suffer, at least periodically, from a whole range of maladies related to poor or ill-fitting dentures. These include sore spots, loss of confidence to smile the way you'd like, loss of self esteem, lack of ability to taste, chew, and eat the foods you love. We all learned this in grade school, but the first step in the proper digestion of food starts with being able to properly chew our food. Poor ability to chew food leads to inadequate digestion, which results in poor nutrition and an inferior state of general health. 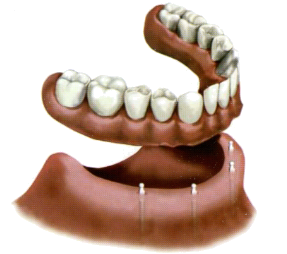 To be sure, Mini Dental Implants (MDI's) are the superior solution to loose dentures. Even MDI's however, if used in conjunction with a poorly fitting or poorly designed denture can lose much of their effectiveness. Therefore, the starting point for changing the lives of our toothless patrons should be with the fabrication of properly engineered, properly designed, and properly fitting dentures. 'Root canal'may be two of the scariest words in the English language. It conjures up images of a long painful dental appointment. When I ask people if they know what a root canal is, the standard answer is "No, but I've heard it's painful." Well, good news. Today with our new technology, root canal treatment is painless and can be accomplished in only one visit. Please let us know if you have any further questions. Oral Surgery is a dental specialty that bridges the connection between dentistry and medicine. Contact Dr. Beckham for more information about Extractions, Dental Implants, Bone Grafting, Mouth and Jaw treatments or Trauma related questions. Some reasons a patient may need surgery, include; Advanced periodontal disease, Fractured teeth or roots, Impacted teeth, Malpositioned teeth, Orthodontic correction or severe decay. We always perform a standard cancer-screening exam at each visit. This includes visual inspection of the oral cavity and throat as well as manual palpation of significant extra oral structures. In addition, we offer the Velscope cancer-screening program. I feel it should be part of every re-care exam. Please read the following text. The statistics are sobering. Ask us to include this test as part of your next check-up. Oral cancer is one of the most curable diseases when it is caught early. That's why your dentist performs an annual VELscope exam, in combination with a conventional visual examination. VELscope uses technology that has been proven successful in identifying precancerous and cancerous abnormalities. VELscope helps us identify oral lesions at their earliest stage of development. When premalignant lesions or early stage oral cancer is found, treatment is simpler, less invasive and more than 90% successful. I love Dr. Beckham and his entire staff. Not only are they the best in dentistry, but they always make me feel like I am their most important patient when I go see them. Every visit is painless and pleasant! Never thought I would ever say that I actually look forward to going to the dentist! Comfortabe, relaxing and caring atmosphere. Dr. Beckham and the rest of the staff were extremely friendly and thoroughly explained everything. They also let me come in before the practice was actually open since I am home from school and don't have a lot of time for an appointment.